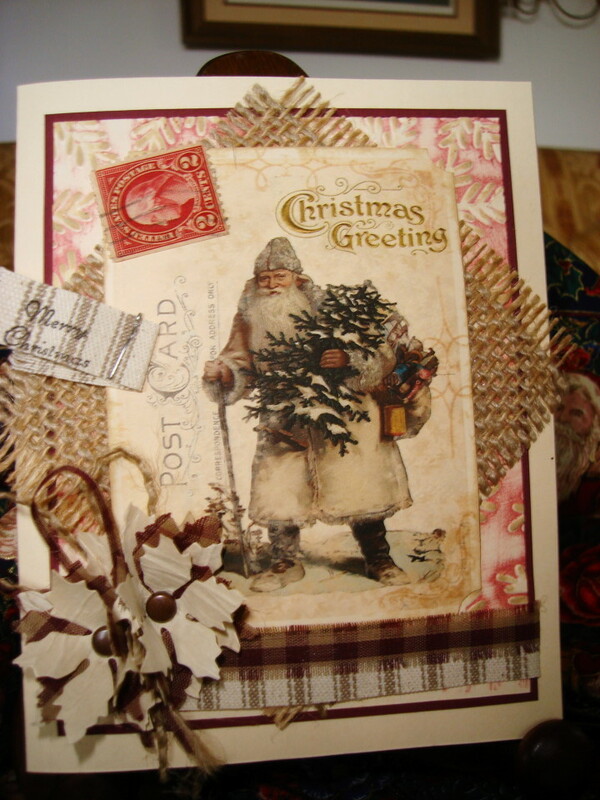 Vada's Blog Stamp Inks and Paper : St. Nicholas, Kriss Kringle, Santa Claus. St. Nicholas, Kriss Kringle, Santa Claus. The Funkie Junkie has a graphic download too. For my card, I went with Linda’s graphic, stain the edges with distress inks, and stamped in some faded stained images. Added an old postage stamp. Mounted it on Terry’s burlap, then added that to a embossed background. Using pillow ticking, and gingham ribbon for trimming. My die is from Tim Holtz’s Movers and Shapers (Poinsettia 658266), and the flowers were cut from paper ribbon and gingham ribbon. Stamps used were Stampin’ Up, Fiskars, and Crafty Secrets. Challenge #36 To Die For. This is a challenge using Die’s or Punches. Stop in and take a look at some of the beautiful artwork. super pretty! 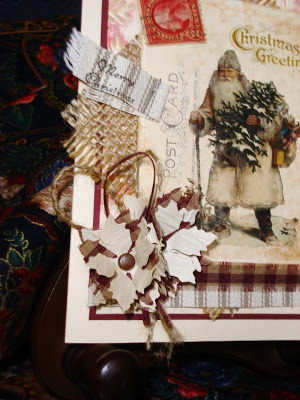 great matting using the burlap and I love the Post Card, plus the nice little touches as well :-) Thanks so much for joining us at Our Creative Corner! Vada you always capture a beautiful sense of nostalgia especially your recent Christmas artful offerings. This is beautiful, what a gorgeous Santa image that is. Thank you for sharing with us at FSC this fortnight. Stunning design and gorgeous card! Love the details you layered and the way they are placed. Thanks for joining us at OCC. That's a gorgeous card. I love the ticking - never thought of using it but it looks lovely! Beautiful, beautiful project. Your santa image is just adorable and your card is so lovely. Thanks for playing along with us at Our Creative Corner. Terry's burlap!!! That was so funny! Vada, there is nothing funny about this vintage Christmas card. 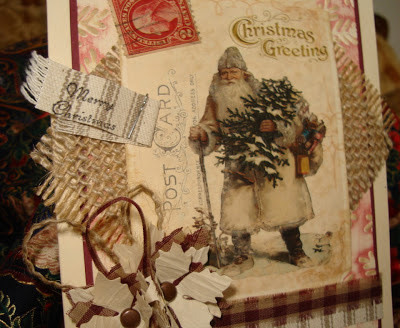 Love that Santa, but all the beautiful details and embellishments really makes this card! Gorgeous!!! Thank you for joining us at FSC! Big Hugs! PS: I heard that Madison was in the mid 60's yesterday! I think you were warmer in your area than me! love the vintage Santa card!!! Such a wonderful collage of elements! Beautiful card, Vada! Love how you've used the burlap and twine and the way you did your stunning flowers. I think there should be a poignant word to describe country shabby chic vintage, because you have NAILED it here. I've had the best time enjoying all your rustic and yet vintage elements. It's like a scene right out of a Christmas classic. 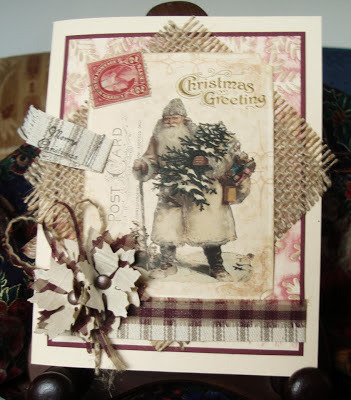 Love that burlap and gingham and your use of Linda's image. The pops of red are defined so beautifully too. Thank you so much for sharing your creativity with us at Our Creative Corner. Best of luck and we'd love to have you visit again next week! WOW! i just love all the added goodies on your card! A lot of hidden treasures to be found. The vintage santa image that you used, is just wonderful! and I love the blossom you added to the left lower corner. thank you for playing along with us @ OCC. Oh my, Vada, your card is simply wonderful! That burlap looks amazing the way you have used it and so does the beautiful flower and twine. I'm so excited you used my vintage santa image and also that you played along with us over at Our Creative Corner. Just a gorgeous piece of work! Lace Valentine Box With Candy.